Despite using dried beans and 25 minutes cook time, came out thin and soupy. Will use less liquid next time. Tasted pretty good though. Bland, uninteresting recipe, unsurprisingly, since the only nuance comes from the onion. Basically just gives the time to cook pinto beans from dried. Other than that, ignore the recipe and season to provide much-needed flavour. Added bay leaf, sage, thyme and parsley. Smoked turkey worked great instead of bacon. This was very quick and easy. I made it up on Sunday to take to work for lunch during the week. I amped it up a bit with an herby seasoned salt blend. Nice! This makes a nice filling stew, without being too heavy. I used home-cooked borlotti beans instead of canned kidney beans, and boneless, skinless chicken thighs, trimmed of fat instead of bone-in thighs. Because of the volume of food, it took 20+ minutes to come up to pressure. Some of my ingredients were cold, so that may be a contributing factor. I think some corn kernels or peas added before serving would add textural interest. Easy and nice flavor with the coco powder. You don’t need to soak the beans - see the note at then of the recipe. Maybe you already own an Instant Pot®?but do you realize all that your pressure cooker can achieve? Are you ready for the perfect electric pressure cookbook companion for your Instant Pot®? With The Instant Pot® Electric Pressure Cooker Cookbook, you’ll explore an inspiring variety of healthy, easy-to-make pressure cooker recipes, from savory breakfasts to hearty stews to decadent desserts, and more. 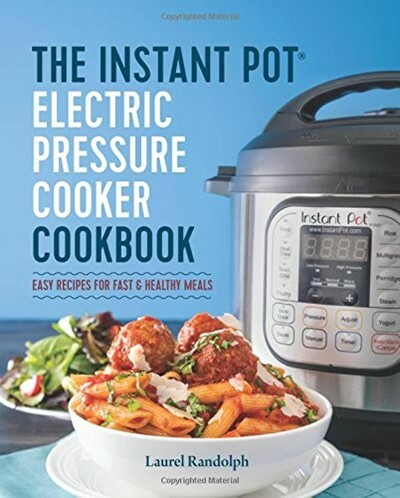 Packed with nutritious, family-friendly pressure cooker recipes, plus vegetarian, gluten-free, and Paleo-friendly options, The Instant Pot® Electric Pressure Cooker Cookbook is your go-to guide for fuss-free, all-in-one cooking.